4064 Calkins Road Dryden Twp, MI. | MLS# 218064109 | The premier resource for all real estate information and services in Metro Detroit. 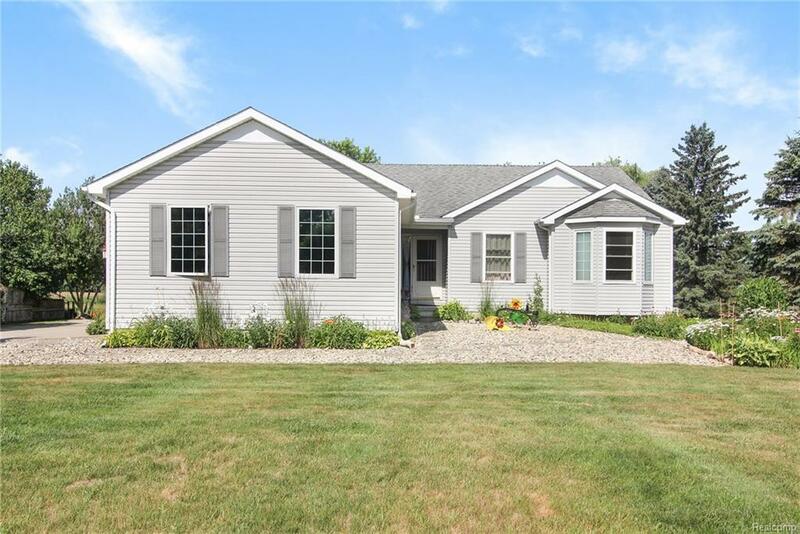 Come see this charming open floor plan 3 bedroom, 2 bath ranch nestled on a peaceful 1-acre lot. Large finished basement perfect for entertaining includes pool table, 55” tv, surround sound and tons of storage space. New sump pump (17), new bladder (16). Convenient 1st-floor laundry. Pella Door wall leads to the expansive covered deck (14x45) overlooking the lush outdoor landscaping, partially fenced yard, and a bonfire pit. Ideal for gatherings or just relaxing on the weekend. Impressive 2.5 car attached garage with epoxy floors, cabinets & electricity. Follow the driveway out to the massive 65x28 pole barn with concrete floor, wood burner, electricity (separate panel), speakers & radio stay. In the back of the pole barn is a fenced in garden with its own irrigation system. All appliance stay. One mile from Seven Ponds Nature Center. Come take a look for yourself, you will be transformed by the tranquil surroundings, spectacular views and inviting warmth of this well-loved home.